Siberia and the Far East contain the world's only remaining untouched natural resources and flora. The plants grow here naturally, freely, abundantly. Accustomed to constantly fighting for survival in the harsh climate, wild grasses have great resilience in Siberia. To use this living energy for the benefit of health and beauty, we apply a minimum of artificial additives, use advanced technologies and strictly control all stages of production. Because of this, the wild grasses can reveal their potential. Natura Siberica is not just natural cosmetics and not just cosmetics made from herbs. This is Russia's first organic cosmetic line and it really works. Highly active wild grasses from Siberia and the Far East. Modern formulas with the highest quality content of plant components. At least 95% of ingredients are vegetable origin. Certified organic extracts and oils. Free of petrochemicals, silicones, parabens, artificial dyes. 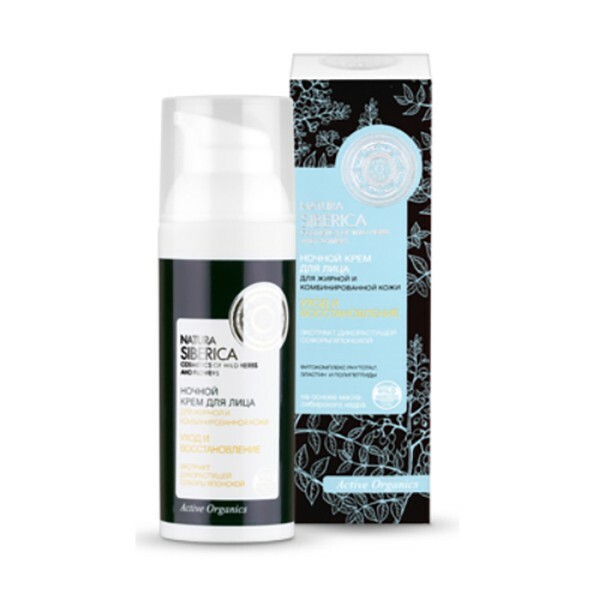 Regenerating Night Cream Natura Siberica light consistency based on the Japanese Sophora provide the necessary protection of the skin from external influences, makes it soft, helps narrow pores and refreshes, soothes and nourishes the skin fully. Ideal for daily care of oily and combination skin. Japanese Sophora extract contains up to 30% rutin (vitamin P), so that helps equalize the relief and strengthening the skin, accelerates regeneration processes, stimulates the protective mechanisms of the skin, regulates the lipid balance; Bisabolol soothes and softens the skin; Elastin allows full depth ulazhnenie; Polypeptides are struggling with the premature aging of the skin and prevent wrinkles.